Speer Gold Dot 9mm +P ammunition continues to lead the field in terms of innovation and overall terminal ballistic effectiveness. As one of the premier law enforcement and self-defense rounds in the country, Speer Gold Dot 124 grain 9mm +P ammunition incorporates several patented features that you simply cannot find in other ammunition. Gold Dot’s patented Uni-core electrochemical process virtually eliminates jacket separation regardless of velocity or contact surface. 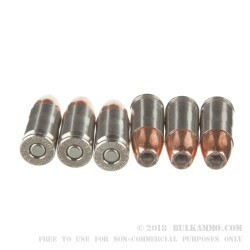 This increases terminal bullet weight retention, resulting in a deeper, more effective wound channel. Nickel plated brass lubricates and reduces friction across the feed ramp, and is virtually corrosion resistant. Resulting in a more reliable feeding and extraction of subsequent rounds, regardless of the environment. CCI Primers come standard, and are guaranteed to create a responsive ignition that will burn hot in even in the coldest of climates. 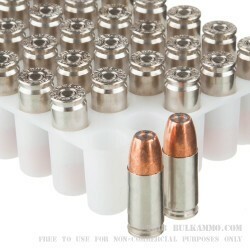 With this Speer 9mm, you’ll get a single box with 50 rounds inside ready to shoot. The patented Gold Dot two-step hollow point cavity allows for a smoother, highly engineered bullet face that encourages rapid expansion, and decreased parasitic drag across the face of the round. 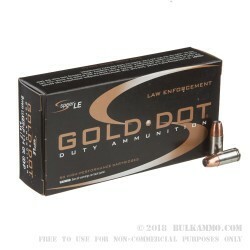 If you are looking for one of the most effective and relied upon rounds in law enforcement today, look no further than the 124gr Speer Gold Dot 9MM +P.